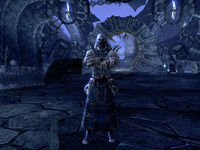 This article is about the version met in Coldharbour. For the enemy in Cath Bedraud, see Angof the Gravesinger (person). Angof the Undying is a Reachman necromancer and the leader of the Bloodthorn Cult. In death, he was sent to the Cliffs of Failure in Coldharbour for displeasing his master, Molag Bal. You have the option to take his side and save him from eternal battling. He expresses regret for his actions and agrees to aid in the fight against Bal in the hopes of curing his corruption or the means for a true death. His aid consists of summonable zombies from Dremora corpses in the first section of the Endless Stair. 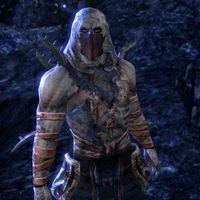 Angof the Undying can be encountered in Coldharbour, as a contestant at the Cliffs of Failure. When you first enter the portal the cliffs you can find some possibly familiar faces as argue about mages and matches before Angof mentions you are there. Before entering the battlefield to find the mages, you have the opportunity to speak with Angof. His reaction to you will depend on whether you previously killed him in Glenumbra. "Again you remind me of the monster that I am. You defeated me in life, what more do you ask of me? What do you hope to accomplish by showing up here again?" "I am, no thanks to you. I failed Molag Bal and I was pulled into his realm. Now I fight to regain his favor. But I spit on his favor! I would rather accept nonexistence than be forced to grovel for these scraps from the Dark Lord's table." Then why are you fighting in the game? "I made mistakes. I became a … monster. I don't want Molag Bal's favor, but if I can win this cursed game I might be able to regain my mortal existence. Before I became a monster. Or at least I can hope to earn a true and final death." If this is the first time you have met him, he will instead be resigned. "You have no idea what you just walked into. You should never have come here." "The one who runs this game, the Observer. He uses us as an amusement. He promises freedom and forgiveness. Lofty ambitions that are most certainly unattainable. Yet we continue to fight. It's either this or nonexistence." What can you tell me about this game? "What's to tell? It's an endless game of torture, a snare for any who walk into its grasp. They promise us freedom if we win, yet none of us can seem to gain the upper hand. It's maddening! I fear we shall have to play forever and ever." After planting the Angof's Seeds for Juline Ginis, when you return to her, Angof will be there helping her. "This woman will live. I have made sure of that. She is too valuable to lose so early in the contest. You may have accomplished her task, but I know she will help me in the end. For this reason, her life is not forfeit." It almost sounds like you care. "Do not attempt to know my heart, mortal. Juline is pure. Unlike the rest of my army, she's not tainted by corruption. I need one such as her if I am to win this war." All this just so you can serve Molag Bal once more? "Serve the Lord of Schemes? Never again, mortal! I fight this battle to live. To reverse what I'd become. This magic that made me like this hides in this realm. As does the magic to restore me." You want to be mortal? "I want to become whole again. That's why I play this ridiculous game. Now leave me. The seeds have increased my forces and given me the numbers I need to win this war. That's all I required of you." Once you helped all three mages, the Observer will call you back to make you pick a team. You have the opportunity to speak with Angof before choosing. He will want to know why you try so hard to save the mages. "You descend a hole that only gets deeper and deeper. Unlike my opponents and I, you can still leave this place. Yet you linger, hoping that you can somehow save the mortals from the Mages Guild. How curious!" I will save the members of the Mages Guild. "Do I sense overconfidence or just plain stupidity? This isn't your fight. This isn't your war. Don't you understand that? We're here because we disappointed a Daedric Prince—the very same one you came here to defeat!" Your response will differ depending on your previous history. "Why would someone such as yourself risk so much for the lives of others? You stand in a dragon's lair. The way is clear behind you, yet you insist on moving forward, provoking the dragon with every step you take. It's maddening to me!" "And I respect you for that, hence my warning. When last we fought, things were different. We were in the mortal realm, playing by mortal rules. In Oblivion, the rules are different. We have no power. We only have what the Lord of Schemes allows." If you chose Angof to side with, you can find him in his camp along with Juline, looking down at the battleground. "We make many decisions in life that we truly believe are correct when we make them. This body, for example. It was a gift from the lord of this realm. He said it would grant me the power to topple the corruption of Glenumbra. He lied." I'm only here to save the Mages Guild members. "Look around, you fool! Would you open the cage of one prison simply to release them into another? This whole realm is a prison! No, there is no way to save your mages. We are all trapped here. Forever." Then why do you keep fighting? "The magic that created this body resides in this land. If I can win this game and escape these Cliffs of Failure, I hope to find its source. Help me win and you can take Juline with you. I simply seek a way to end this madness." How do we win the game? "Thallik and Estre's champions must fall. Use my seeds. Plant them in the bodies of those you slay to gain new allies to aid you. It won't be easy, and you probably won't win, but you're the best chance I've had to end this since I got here." I'll deal with the other champions. After defeating both the champions and the Observer himself, you will return to the cliff top to find Angof and the Mages in separate cages. Estre and Thallik will be been turned to stone and posed in front of them. The revived Observer will then give you a choice, to take the mages or take Angof. If you speak with Angof he will demand you save the mages and yourself. "Leave me! You must take the others and go. That is your only option." You'd rather remain trapped in the game? "Look at me! I'm a monster! I deserve my fate. The others … they did nothing wrong. You came here to save them, so finish what you started!" But you'd be a great help in my efforts against Molag Bal. "It doesn't matter. You did what I could not. You won the game. Now take the mages and get away from here before the Observer changes the rules again!" "I had friends and allies once. Companions who would never abandon me, no matter the cost. But that was before. Before I became this … monster. Enough! I must find the magic to restore my human form." There's a safe haven to the west. The Hollow City. "I have heard rumors of such a place. We shall go there at once. And have no fear. I will make sure that your friends arrive safely. Perhaps the city will provide me more clues as to the magic I seek." After completing the quest, he will say, "We will find this city you speak of. With Juline at my side, the journey will be easier." However, if you only saved Angof, he will still pledge to help you. "I had allies and friends once. I understand this was not an easy choice for you. Help me restore my mortal self and you will have my support. On this, you have my word." "I have heard rumors of such a place. Just remember our agreement. Help me find a way to become what I once was and I will aid you against Molag Bal. If you rescued Angof, he can be found in the House of Darkness within the Hollow City. Angof will be defensive about the decor. "The choice of decor was not my own, if that's what you're wondering. It would appear that this city had its own worshippers of death. 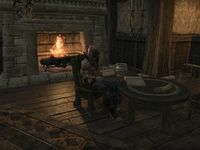 I guess even Meridia did not know everything that went on under her very nose." Other times he can be found wandering around the Hollow City looking at the plant life. "To see everything so alive and full of energy pleases me greatly. It is a stark contrast to the world outside these walls. It reminds me of my time in Glenumbra, when things were … better." 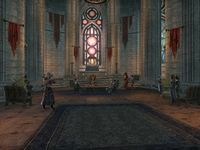 When the War Council is held in the Chapel of Light, Angof will attend if he is in the city. "Remember our deal. I help you, then you help me. Everything else is just so much sound and fury." Once you enter the doorway to the Endless Stair, Angof will be near the entrance and ready to render you aid. "The Dark Lord's vile scheme fails today." "I gave you my oath and I honor such commitments. You sampled my power at the Cliffs of Failure. Use the power of my thorns as you see fit." "Take this seed. Plant it in the body of any dead Dremora, as you did before. A zombie will rise to fight by your side. Together, we will bring the Lord of Schemes' plans down around him." You will then receive Angof's Seed which can be used as long as you are in the first section of the Endless Stair. When you find him at the Endless Stair, his nameplate will just call him Angof. This page was last modified on 4 February 2019, at 21:08.